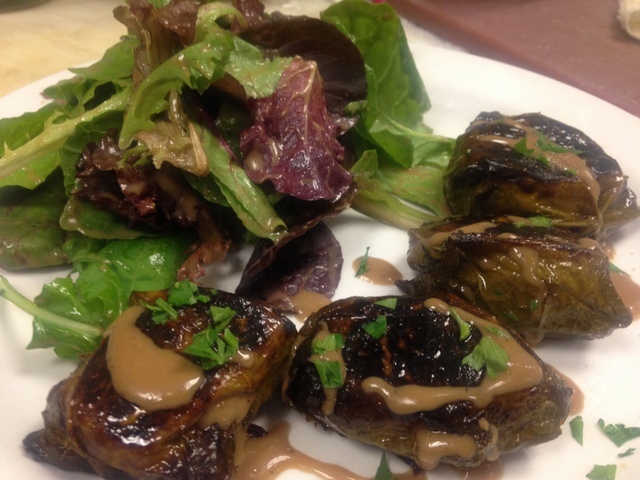 This week we’re trying a new special: seared stuffed grape leaves. We use preserved grape leaves in brine. You can find these at any store that specializes in middle eastern ingredients. We remove the stem from each leaf, then add a chunk of goat cheese, seasoned with black pepper. We avoid adding salt, because the leaves are already salty. We then add some of our sun-dried tomato pesto and basil, then fold each side of the leaf over in a clockwise pattern. To serve, we quickly pan-sear the stuffed leaves on both sides in a little olive oil, and serve with a balsamic vinaigrette.